Bartholomew Dias (English: Bartholomew Diaz) (Algarve, 1450 - Cape of Good Hope, May 29, 1500) was a Portuguese explorer who sailed around the Cape of Good Hope, the southern tip of Africa. In 1481, he accompanied Diogo de Azambuja on an expedition on the Gold Coast. 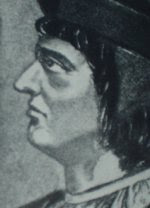 Bartolomeu Dias was a knight of the royal palace, the royal warehouse keeper heads and experts of the army sailed São Cristóvão (Saint Christopher). King John II of Portugal appointed him on October 10, 1486 as the head of the expedition to sail around the southern tip of Africa with the hope of finding a new trade route leading to Asia. Dias was a Knight of the royal court, royal warehouse supervisor, and the sailing-master of the war-the, São Cristóvão (Saint Christopher). King John II of Portugal appointed him, on October 10, 1486, to head an expedition to sail around the southern tip of Africa in the hope of finding a trade route to India. Another purpose of the expedition was to try to review the countries reported by João Afonso de Aveiro (probably Ethiopia and Aden) with Portuguese desired friendly relations. Dias also be looking for land ruled by Prester John, who was a fabled Christian priest and African prince. Dias left Lisbon in August, 1487 led an expedition of three ships. His principal, São Cristóvão Caravel, piloted by Pero de Alenquer. A second Caravel, São Pantaleão, commanded by João Infante and piloted by Alvaro Martins. Dias brothers' captain Pero Dias is square installing support with João de Santiago as pilot. The expedition sailed south along the coast of West Africa. Extra provisions were picked up in the middle of the street in the Portuguese fortress of Sao Jorge de Mina on the Gold Coast. After the last sailing Angola Dias reached reaches Golfo da Conceição (Walvis Bay) in December. Having rounded the Cape of Good Hope at a considerable distance, Dias continued east and entered what he named Aguada de Sao bras (Bay of Saint Blaise) - later renamed Mossel Bay - on February 3, 1488. Dias expedition reached its furthest point on March 12, 1488 when they docked in Kwaaihoek, near the mouth of the Bushman's River, where padrão-the Padrão de São Gregorio - before re-established  Dias wanted to continue sailing. India, but he was forced to turn back when his crew refused to go further  He was only on the way home that he actually discovered the Cape of Good Hope, May 1488 .. Dias returned to Lisbon in December of that year, after the absence of sixteen months. The discovery portion around Africa was significant because, for the first time, Europeans could trade directly with India and other parts of Asia, passing through the land routes through the Middle East, with expensive middlemen. Official reports have been lost expedition. Dias was originally named the Cape of Good Hope in the "Cape of Storms" (Cabo das Tormentas). It was later renamed by King John II of Portugal to the Cape of Good Hope (Cabo da Boa Esperança) because it represented the opening of a route to the east. Using his experience with explorative travel, Dias helped in the construction of São Gabriel and its sister ship, the São Rafael used by Vasco da Gama around the Cape and continue the route to India. Dias only participated in the first leg of the trip da Gama, to the Cape Verde Islands. He was then one of the chief second Indian expedition, led by Pedro Alvares Cabral. The first fleet reached the coast of Brazil, took possession of it in 1500, and then continued eastward to India. Dias died near the Cape of Good Hope that he presciently had named Cape of Storms. Four ships having a great storm of robes and lost, including Dias', on May 29, 1500. A shipwreck discovered in 2008 by Namdeb Diamond Corporation off Namibia was initially considered possible ship Dias',  However, the coins recovered from a later time. * António Dias de Novais, a Knight of the Order of Christ, married to (apparently his relative, since the surname de Novais was transmitted through her brother's offspring) Joana Fernandes, daughter Fernao Pires and wife Guiomar Montes (and sister Brites Fernandes and Fernao Pires, married to Ines Nogueira, daughter of Jorge Nogueira and wife, and had a problem). grandchildren Dias' Paulo Dias de Novais is Portuguese colonizers in Africa in the 16th century. grandchildren Dias', Guiomar de Novais was married twice, the second wife to Dom Rodrigo de Castro, son of Dom Nuno de Castro and his wife Joana da Silveira, by whom he Dona Paula de Novais and Dona Violante de Castro, both died unmarried and without problems, and to Pedro Correia da Silva, a natural son Cristóvão Correia da Silva, with no problems.